Happy Lunar New Year! Year 2017 is the Year of the Rooster! To welcome in the Lunar New Year (called Tết in Việt and 新年 in Chinese), we made Rooster greeting cards to fill red envelopes (called lì xì in Vietnamese, hong bao in Mandarin, lai see in Cantonese). In our cultures, these red envelopes represent good luck and are distributed to children and unmarried individuals. We deviated from tradition in that we gifted red envelopes to some of our other family and friends as well. We also made it multilingual to represent our joint cultures: Vietnamese, Chinese, American, and Canadian. 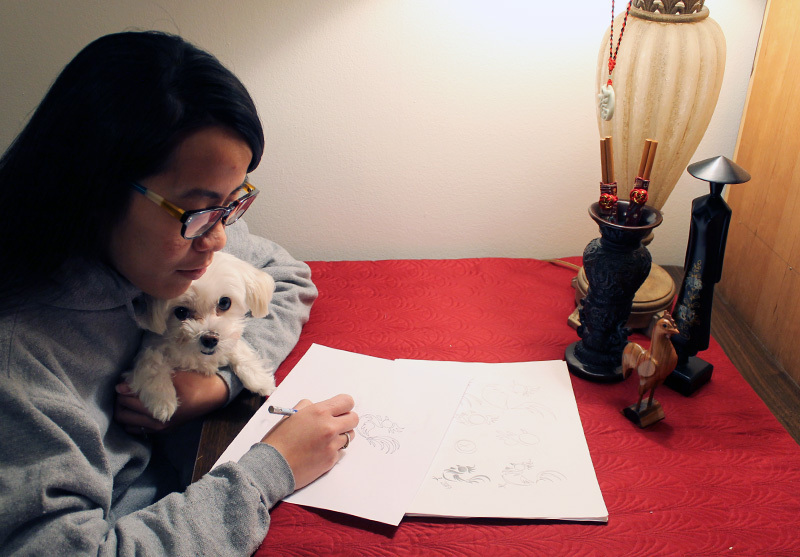 To start our project, Kathy Mây sketched the design. We decided to go with a clean image, one that was bold enough to reflect the confidence and showmanship that is typical of the Rooster. Silas scanned the sketch into the computer. He used Illustrator to trace it and then clean it up into a final vector drawing that can be understood by the laser cutter. 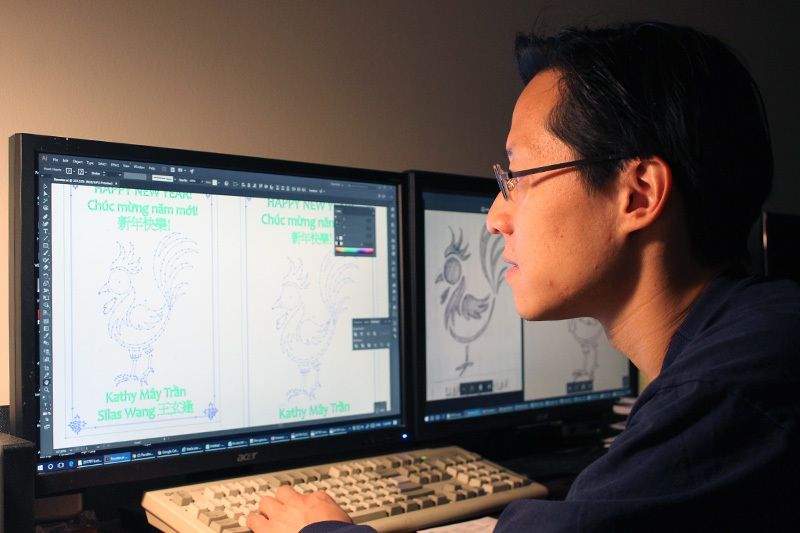 He then added trilingual text and a simple East-Southeast-Asian inspired design that did not overwhelm the Rooster, who thrives upon being the center of attention. In the Illustrator file, different colors corresponding to different laser settings. We used the laser cutter at Boston Makers to complete our project! Based in Jamaica Plain, Boston Makers is a nonprofit organization that provides a collaborative workspace to encourage creativity and engage the maker spirit in the community – young and old, gals and guys, novices and experienced makers of all kinds! We have been volunteering there as hosts to staff the space and help people use the equipment to create their projects. If you are interested in learning or pursuing 3D printing, soldering and electronics, textiles and fabric arts, woodworking, arts and crafts, or any other kind of project, please let us know in the comments below! 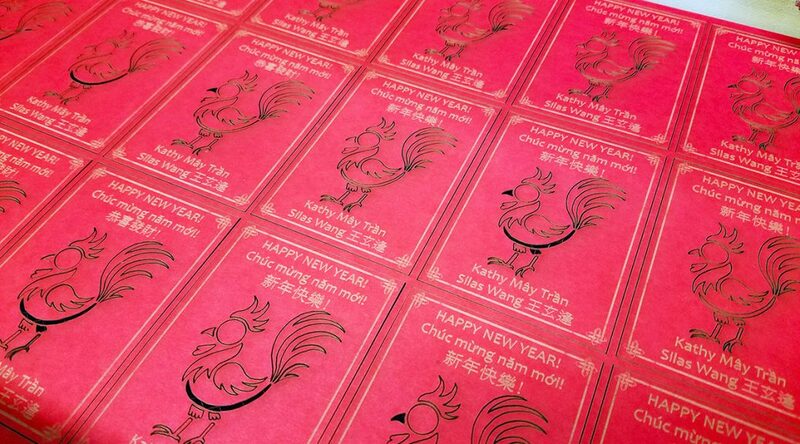 Each rooster card was 65 x 95 mm, the perfect size to fit in a red envelope. Here is the card evolving through its stages of creation, from sketch to vector art, to finished product! 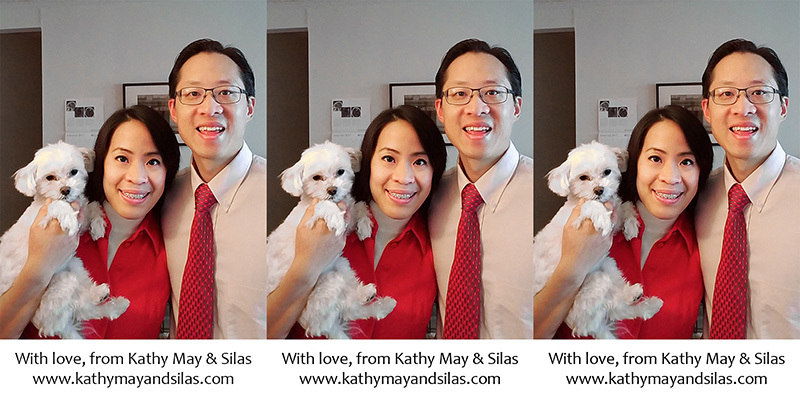 In addition to the Rooster card, each red envelope also contained our annual picture – in color coordination, of course – to commemorate the Lunar New Year. Happy Lunar New Year! This year we wish you peace, happiness, good health, and anything your heart desires! Chúc mừng năm mới! Năm này mình chúc bạn bình an, hạnh phúc, sức khỏe, và vạn sự như ý!